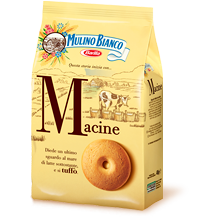 Made with simple ingredients, Mulino Bianco Macine are rich of cream for a fuller flavour. Perfect for dipping into your morning coffee or tea! Mulino Bianco offers a wide selection of biscuits - whichever you choose you are sure to find something special! Wheat flour, sugar, vegetable margarine, wheat starch, eggs, butter, fresh pasturised cream (2,5%), glucose syrup, cooking salt, raising agents (sodium acid carbonate, ammonium acid carbonate, cream of tartar), vanilla flavourings.